Complex chemistry in the dwarf planet’s upper atmosphere may explain one of its biggest mysteries. The temperature of Pluto's atmosphere is only about 70 degrees Celsius above absolute zero. Pluto’s atmosphere is even more bone-chillingly cold than one might expect 5 billion kilometres from the Sun. New research suggests that’s because of the smog that envelops the dwarf planet. “Haze is responsible for all the atmospheric cooling,” says Xi Zhang, a planetary scientist at the University of California in Santa Cruz. He and his colleagues describe the findings in the 16 November issue of Nature1. When NASA’s New Horizons spacecraft flew past Pluto in July 2015, it discovered that the atmosphere was about -203 ºC, just 70 degrees above absolute zero2. That’s around 30 degrees colder than predicted — and a big mystery to planetary scientists. Figuring out how Pluto’s atmosphere works is crucial for understanding atmospheres on other large icy worlds in the Solar System and beyond. “Until we know the reason for the cold temperatures, we can’t extrapolate to other seasons on Pluto, much less other bodies,” says Leslie Young, a planetary scientist at the Southwest Research Institute in Boulder, Colorado, who was not involved in the study. Pluto’s atmosphere is made mostly of nitrogen, with smaller amounts of compounds such as methane. High in the atmosphere — between 500 and 1,000 kilometres above the surface — sunlight triggers chemical reactions that transform some of these gases into solid hydrocarbon particles. The particles then drift downward and, at around 350 kilometres above Pluto’s surface, clump with others to form long chemical chains. By the time they reach 200 kilometres’ altitude, the particles have transformed into thick layers of haze, which the New Horizons spacecraft saw dramatically blanketing Pluto. Zhang and his colleagues compared the heating and cooling effects of the atmosphere’s gas molecules to those of its haze particles. Earlier studies have suggested that the presence of gas molecules, such as hydrogen cyanide, could help explain why Pluto’s atmosphere is so cold3. But Zhang’s team found that including haze was the only way to get their model to match the temperatures that New Horizons measured as it flew by the dwarf planet. “The fundamental difference is the size,” Zhang says. Molecules are typically less than a nanometre across, whereas the haze particles are several hundred nanometres across. That means that the gas and the haze behave very differently in the way they absorb and re-radiate energy from the Sun. Haze turns out to both heat up and cool down more efficiently than gas, Zhang says. “It is a neat idea,” says Sarah Hörst, a planetary scientist at Johns Hopkins University in Baltimore, Maryland. Scientists probably hadn't thought about haze as the cooling culprit before because the haze layers do not block light, says Tanguy Bertrand, a planetary scientist at the Laboratory for Dynamic Meteorology in Paris who has studied Pluto's atmosphere with his colleague François Forget4. “I find this study very convincing,” Bertrand says. 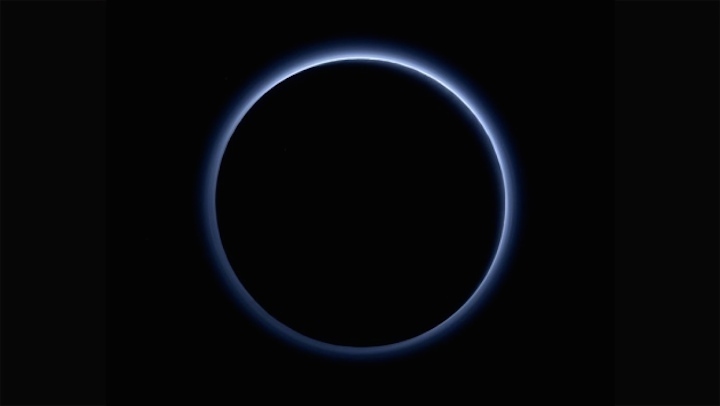 But other researchers have proposed different ideas about why Pluto’s atmosphere is so cold. Roger Yelle, a planetary scientist at the University of Arizona in Tucson, reported one such approach at a conference in Latvia in September. His team’s model suggests that a combination of hydrogen cyanide, acetylene and ethane gas can cool things down. All three gases are known to exist in Pluto’s atmosphere. Zhang’s team and Yelle’s team have yet to reconcile their contradictory conclusions. But after it launches in 2019, NASA’s James Webb Space Telescope could test Zhang's proposal. If the haze particles are indeed the main factor cooling Pluto’s atmosphere, they would make the dwarf planet appear relatively bright in mid-infrared wavelengths. Zhang hopes to observe Pluto with the Webb telescope to see if his team is right.